Difference between revisions of "PolicyStoreConfigurationFiles"
This file becomes the policies [[PolicyConfigurationFiles#contexts/files/file_contexts | contexts/files/file_contexts]] file and is built from entries in the [[#modules/active/file_contexts.template | modules/active/file_contexts.template]] file as explained above and shown in the [http://taiga.selinuxproject.org/~rhaines/NB4-diagrams/25-file_contexts.png File Context Configuration Files] diagram. It is then used by the file labeling utilities to ensure that files and directories are labeled according to the policy. This file becomes the policies [[PolicyConfigurationFiles#contexts/files/file_contexts | contexts/files/file_contexts]] file and is built from entries in the [[#modules/active/file_contexts.template | modules/active/file_contexts.template]] file as explained above and shown in the [http://selinuxproject.org/~rhaines/NB4-diagrams/25-file_contexts.png File Context Configuration Files] diagram. It is then used by the file labeling utilities to ensure that files and directories are labeled according to the policy. The format of the file_contexts file is the same as the [[#modules/active/file_contexts.template | modules/active/file_contexts.template]] file. 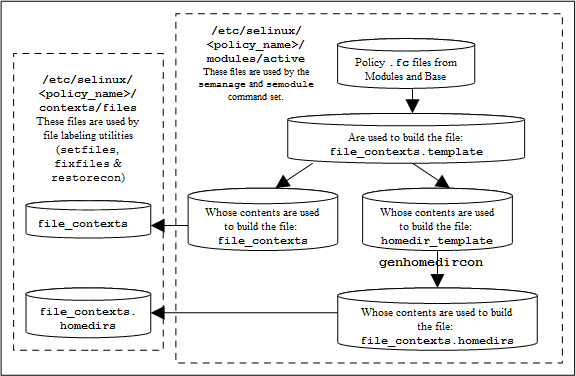 This file is built from entries in the [[#modules/active/file_contexts.template | file_contexts.template]] file (as shown in the [http://taiga.selinuxproject.org/~rhaines/NB4-diagrams/25-file_contexts.png File Context Configuration Files] diagram) and explained in the [[#modules/modules/active/file_contexts.template | modules/active/file_contexts.template]] section.